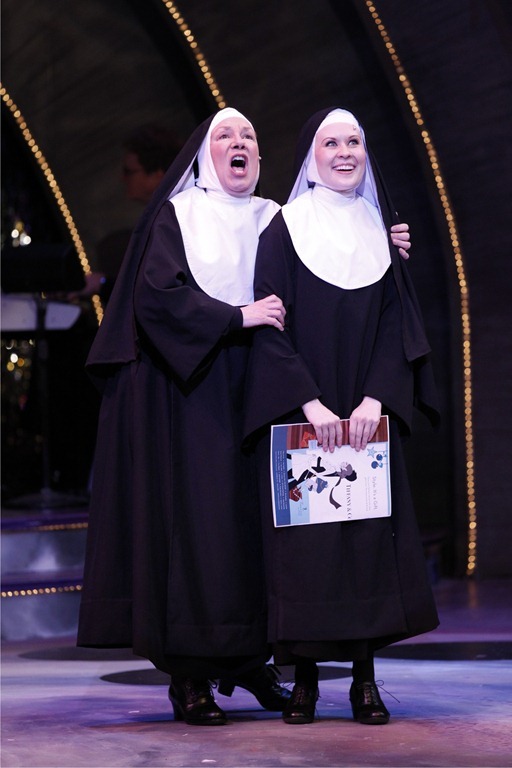 They say, “When you find something that works for you, stick to it.” Dan Goggin has made a living off of his troop of fictional nuns from Hoboken, New Jersey since the debut of his smash hit musical Nunsense in 1985. 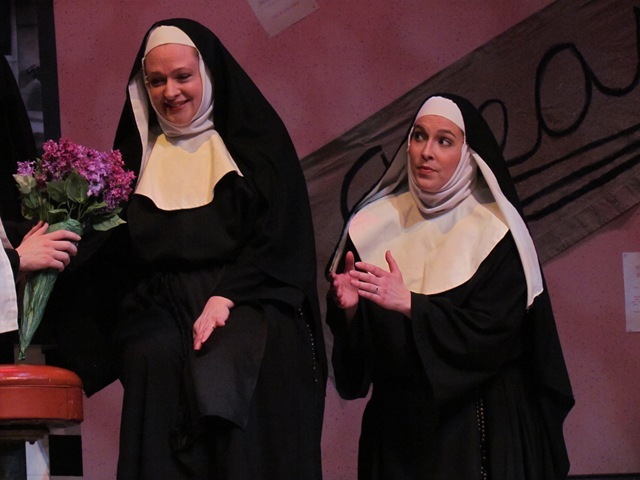 After seven spin-offs Goggin has penned the latest nun adventure, Nunset Boulevard. 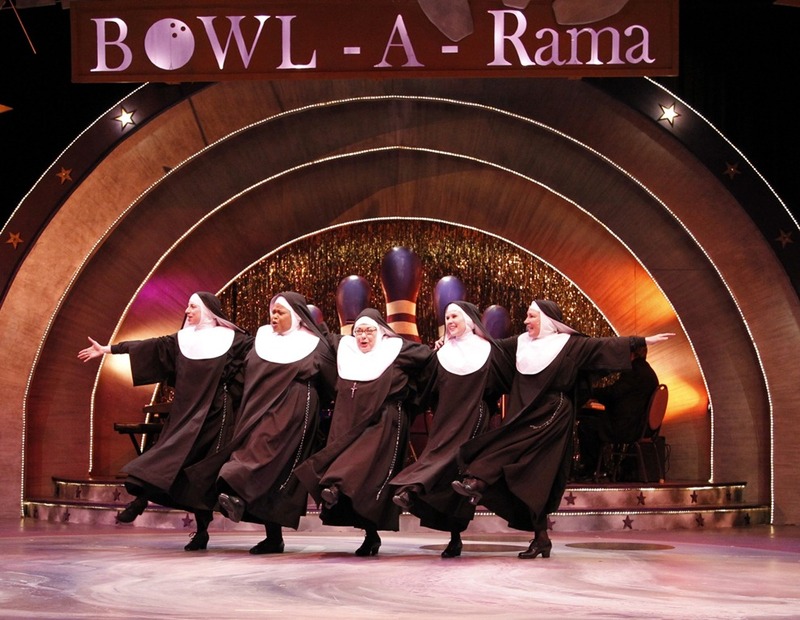 The musical nuns from Jersey travel to California for a gig at the Hollywood Bowl….-A-Rama. It makes some sense that the Chicago area premiere of this new show is being produced at Theater at the Center in Munster, Indiana, since, after all, Northwest Indiana is seemingly Chicago’s Jersey. It’s where we send our landfill, refining and casino gamblers. In this case, it’s where we send somewhat tired musical comedy such as this production directed rather flatly by Stacey Flaster. While there is some huge talent (namely Tony award nominee Felicia Fields) and occasional chuckles, it’s not quite worth the trip down I-90/94 for what is ultimately a cabaret show with too much space to fill. In their latest outing, our showbiz sisters arrive in Hollywood for what they think is a booking at the famous Hollywood Bowl. Instead, they are scheduled to appear at the Hollywood Bowl-A-Rama, a bowling alley somewhere in Hollywood. 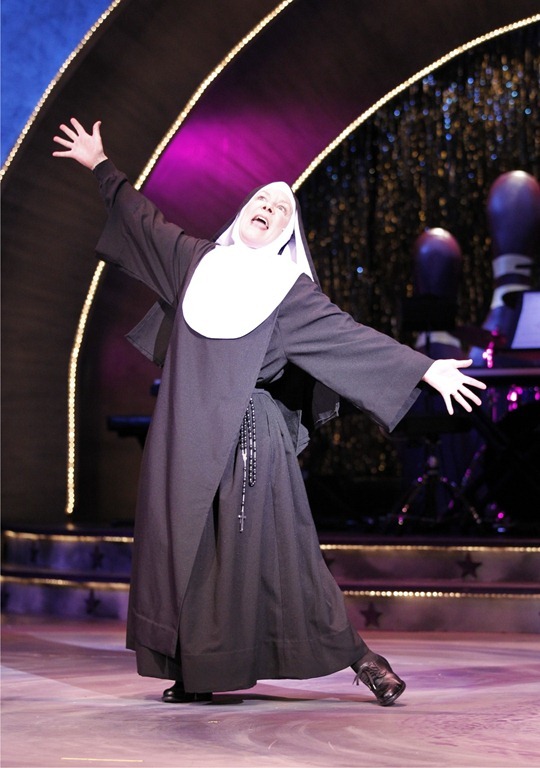 While generally Goggin’s nun shows are largely a cabaret style, Sister Hubert (Fields) suggests in this production that they include a plot (in one of the more fun musical numbers of the night). The show is still primarily though a cabaret style performance of comedic bits, musical numbers, improv and interacting with the audience (probably the highlight of the evening). However, there is a through line revolving around Sister Leo (Nicole Miller) and her quest to get “discovered” in Hollywood. It turns out a movie musical about nuns is auditioning across the street. Sister Robert Anne (Mary Robin Roth) is skeptical. She is especially conflicted when Sister Leo asks permission to appear before the casting director without wearing her habit. There is also Sister Amnesia (Lauren Creel), whose schitck is that she lost her memory due to a giant crucifix falling on her head. The raunchier bits play the best, however there are not many of them. 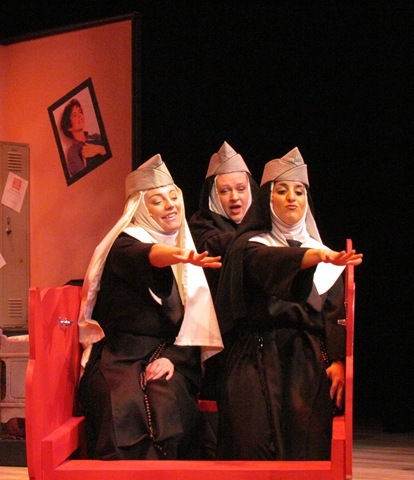 During the improv segment with the audience, there is a game made of naming famous nuns from the movies which rewards certain audience members with very funny religious keepsakes. 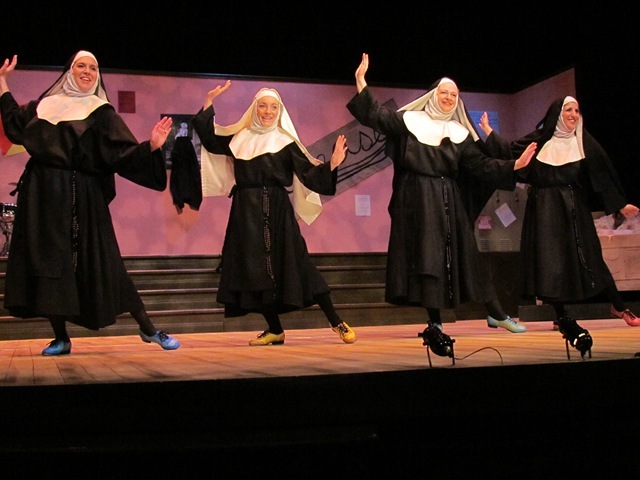 The fact that the nuns sing and dance isn’t novel enough anymore to carry the interest of the audience over two hours. The Hollywood they are visiting is decidedly a Hollywood of old with songs like “Whatever Happened to Baby Jane” and a parade of classic Hollywood blonde bombshells. Fields provides some wonderful vocals and dry humor to the evening. Creel and Miller are also standouts with their energy. But, Flaster’s direction, along with certain performances, hamper the pacing. There’s a comedy-killing pause between nearly every line dragging the show down. The cast overall plays too small to fill this space. Also, there were numerous instances where several actors were restarting lines which took the wind out of any possibility for consistent laughs. Stephen Carmody’s set is a “Vegas meets Magic Kingdom” take on Hollywood. The expansive facade could hold a big band and 20 chorus girls. Instead, we get 3 keyboardists, a drum kit and five nuns. The one-liners and corny, yet sometimes delightful, tunes come across as though they would fit better in a nightclub setting. The formality of this large theatre complex drowns out most of the charm. Overall, the production elements are too polished and gaudy in contrast with what’s essentially comedic sketches and light songs. The vastness of the theater demands too much non-stop entertainment. I feel the same show could be placed in a setting such as Mary’s Attic (an upstairs bar lounge in Andersonville) and achieve a much better effect on its audience. There is definitely something here for diehard fans of Goggin’s nun series, but not enough to spark any excitement as these Jersey girls’ take on Tinsel Town. Theatre at the Center presents the Chicago Area premiere of Dan Goggin’s Nunset Boulevard, directed by Stacey Flaster, April 28- May 29 at 1040 Ridge Rd, Munster, IN. 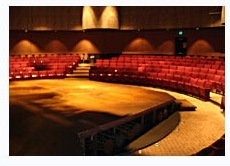 The performance schedule is Fridays and Saturdays at 8:00 p.m.; Wednesdays and Thursdays at 2:00 p.m. The play runs 2 hours and 15 minutes with one intermission. Tickets are $36 on Wednesdays-Thursdays, and $20-$40 Fridays- Sundays. Tickets may be purchased by phone (219-836-3255) or online at theatreatthecenter.com. Coming off of a streak of some of the most successful seasons to date, Theatre at the Center Artistic Director William Pullinsi, announces their 2011 season, including Anthony Shaffer’s Sleuth, Nunset Boulevard, The Wiz, Guys and Dolls and Another Night Before Christmas. The season opens with one of the greatest stage thrillers, the masterpiece of suspense, Sleuth. The play, written by Andrew Shaffer, won the Tony Award for Best Play and inspired two film versions. When an aging mystery writer lures his wife’s lover to his mansion, the younger man becomes unwittingly drawn into a tangled web of intrigue and gamesmanship, where nothing is quite as it seems. This edge-of-your-seat mystery filled with cunning plot twists is not only an exciting "whodunit" but a fascinating “whodunwhat." The New York Times says Sleuth is "Clever, intricate…good, neat, clean and bloody fun and I most cordially recommend it.” Sleuth will be directed by Theatre at the Center Artistic Director William Pullinsi and will run February 17 through March 20, 2011. 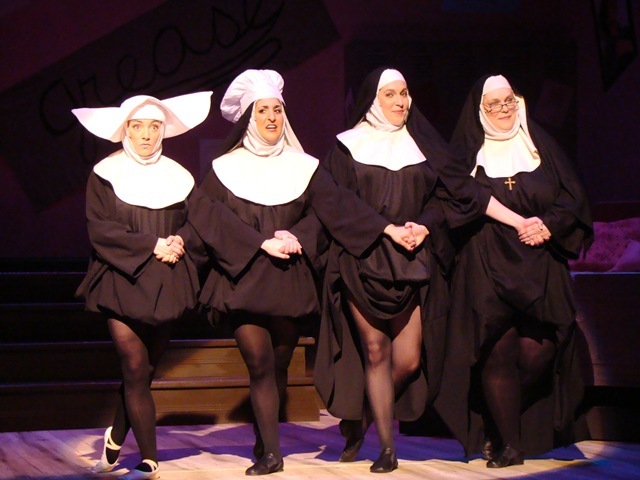 Directed and choreographed by Stacey Flaster, Theatre at the Center presents the Chicago Area Premiere of the newest addition to Dan Goggin’s hilarious NUNSENSE line-up: Nunset Boulevard running April 28 through May 29, 2011. 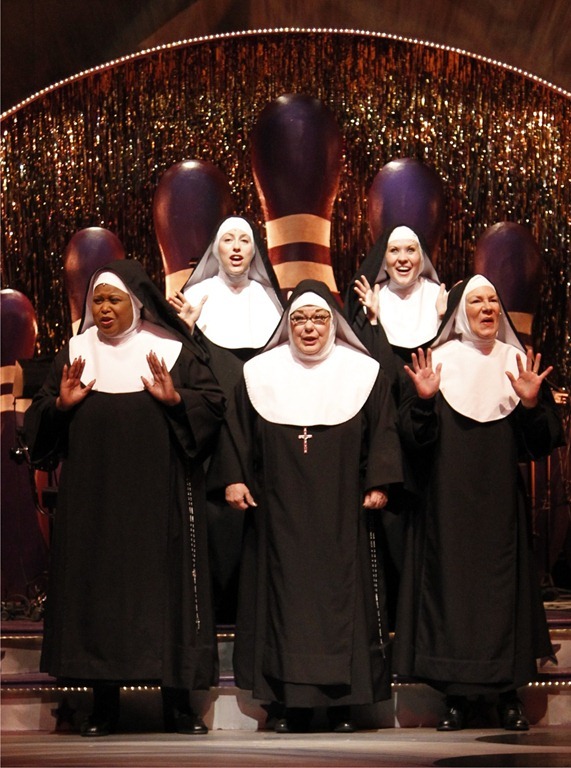 The Little Sisters of Hoboken have been invited to sing at the Hollywood Bowl. They are thrilled at the prospect until they arrive and realize that they are booked into the Hollywood Bowl-A-Rama, a bowling alley with a cabaret lounge; having to contend with announcements from the bowling alley public address system as well as the activity on the lanes. The light at the end of the tunnel comes when word arises that a famous movie producer is auditioning across the street roles for his new movie musical, "NUNSET BOULEVARD: A Song from the Hart," about the life of Dolores Hart, the famous movie star who became a nun. The Sisters, who think they are obvious naturals for parts, race off to audition. NBC News raves,"Talk about a happy habit. The "nuns" have done it again. Sinfully funny laughs for the entire two hours." The Tony Award-winning musical, The Wiz, plays Theatre at the Center July 7 through August 7, 2011. The R&B musical adaptation of the book “The Wonderful Wizard of Oz” by L. Frank Baum first opened on Broadway in 1975. Dorothy’s adventures in the Land of Oz have been set in a dazzling, lively mixture of rock, gospel and soul music. Its Broadway run, for four years and over 1600 performances, was historic as a large-scale big-budget musical featuring an all-African American cast. The production features the music and lyrics of Charlie Smalls and book by William F. Brown. It won seven Tony Awards including Best Musical and was later produced in the 1978 Motown/Universal motion picture adaptation starring Diana Ross, Michael Jackson, Lena Horne, and Richard Pryor. Time Magazine says The Wiz is “a carnival of fun… a wickedly amusing show.” Stacey Flaster will direct and choreograph the production. Based on “The Idyll of Sarah Brown” by Damon Runyon, Guys and Dolls is an exhilarating Tony Award-winning romantic comedy packed with gamblers, gangsters, missionaries, showgirls, and lively fun. Theatre at the Center Artistic Director William Pullinsi will direct the production running September 15 – October 16, 2011. Guys and Dolls is the story of a group of gamblers in New York and the ladies in their lives. Sky has been bet that he can’t make the next lady that he sees fall in love with him, and when that next lady happens to be the prim and proper neighborhood missionary Sarah Brown, the stage is set for an evening of high-spirited entertainment. Frank Loesser‘s toe-tapping score includes “Luck Be A Lady,” “Sit Down You’re Rocking The Boat” and “If I Were a Bell.” Guys and Dolls premiered on Broadway on November 24, 1950 and ran for 1,200 performances, winning five 1951 Tony Awards. In London it ran for 555 performances. In 1955 the acclaimed film version was released, starring Marlon Brando, Frank Sinatra, Jean Simmons and Vivian Blaine. From the writers of MARRIED ALIVE! and A DOG’S LIFE Sean Grennan and Leah Okimoto, comes Another Night Before Christmas, bringing holiday cheer to Theatre at the Center November 17 through December 18, 2011. Another Night Before Christmas tells the story of burnt-out social worker Karol Elliot, who is having a crisis of Christmas spirit. While heading home on a lonely Christmas Eve, she shares her groceries with a homeless man who decides to show his thanks and rekindle her holiday cheer by breaking into her apartment later that night insisting that he’s Santa Claus. Instead of stealing her belongings, he brings in a bag of goodies and transforms her downtown apartment into a blinking, red and green wonderland. Before long Karol begins to wonder, is this bearded stranger more than what he seems? Another Night Before Christmas is a delight for the whole family. This witty and tuneful holiday favorite, Directed by William Pullinsi, is a Chicago Area Premiere and is sure to win laughs from anyone who’s ever lost – or found – the holiday spirit.